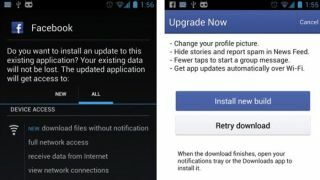 Is Google's latest Play Store update a direct blow to Facebook? Sorry, Facebook. No auto-updates for you. Google released another version of the Google Play Store app for Android today, and though it's not a major facelift like the last update, it did bring one important change. The update included a policy change that will prevent apps from auto-updating. And guess which of Google's competing social networks just added automatic updates that bypass the Google Play Store to its arsenal of tricks? If you said, "Facebook," you win nothing, because it was in the headline. But you're still right. We asked Facebook representatives to share the social network's take on the change, but they had no comment to share at this time. The new Google Play policy dictates that Android app updates must be released and administered through Google Play itself. "An app downloaded from Google Play may not modify, replace or update its own APK binary code using any method other than Google Play's update mechanism," reads an addition to Google Play's developer program policies in today's update. That new stipulation is nestled into a previously existing section called "Dangerous Products," a label that could, from Google's perspective as it continues to focus on its Google+ social network, be applied to Facebook. Google has been making an effort lately to add Google+ features that will help it compete with Facebook, like Google+ app sign-in and big, beautiful cover photos. Regarding today's Google Play update, Google said the following in a statement to Engadget: "Google Play is a trusted source for Android application downloads, and we are committed to providing a secure and consistent experience." Indeed, as the site pointed out, the slight against Facebook could be nothing more than a coincidence.